Climate change will alter the atmospheric energy that fuels weather in the summer, according to a new study from the Massachusetts Institute of Technology (MIT). This could lead to stronger thunderstorms and more stagnant conditions in North America, Europe, and Asia. Rising temperatures, particularly in the Arctic, are redistributing the energy in the atmosphere. As a result, more energy is available to fuel storms, while less energy is available for extratropical cyclones, which are milder weather systems. In contrast to tropical cyclones such as hurricanes, extratropical cyclones are large weather systems that occur just outside of the Earth’s tropical zones. These systems produce abrupt changes in temperature and humidity along weather fronts that make their way across the country. Extratropical cyclones feed off the atmosphere’s horizontal temperature gradient, which is the difference in average temperatures between northern and southern latitudes. For example, the greater the gradient between the Arctic and the equator, the stronger an extratropical cyclone may become. As the Arctic has warmed up faster than the rest of the world in recent decades, the atmosphere’s horizontal temperature gradient has shrunk. 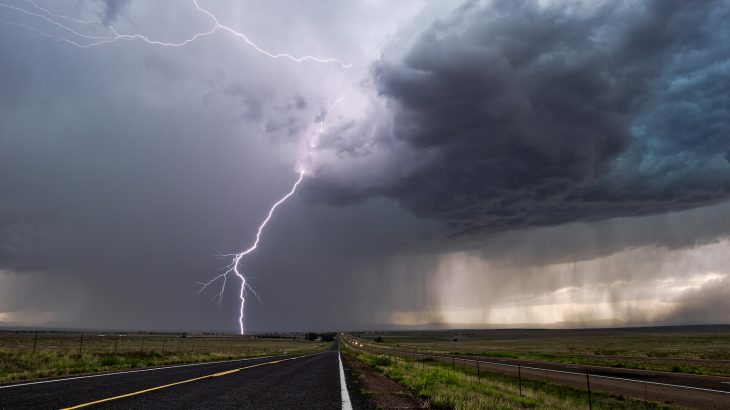 The researchers wanted to know how this warming trend has affected the energy available in the atmosphere for intense summer weather and extratropical cyclones. They examined satellite and weather balloon measurements of temperature and humidity from around the world since the 1970s. Based on the average summertime temperature and humidity between June, July, and August for each year from 1979 to 2017, they developed an algorithm to estimate the amount of energy that would be available in the atmosphere. “We can see how this energy goes up and down over the years, and we can also separate how much energy is available for convection, which would manifest itself as thunderstorms for example, versus larger-scale circulations like extratropical cyclones,” said study co-author Professor Paul O’Gorman.